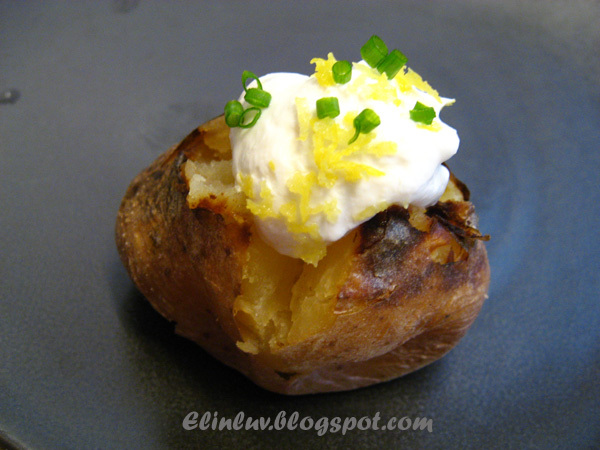 This is another recipe from ' Relaxed Cooking With Curtis Stone ' It is baked potato with sour cream and chives. " Baked potatoes just might be the perfect comfort food. In miniature, they become a great finger food, too. Cooking the potatoes on a bed ofsalt dries them out a bit and gives them a fluffier, drier texture, so they can hold more of the good stuff like sour cream, butter, crispy bacon, grated cheese, or whatever tickles your fancy " Excerpt taken from Curtis Stone Cookbook. The aroma of garlic , sea salt and fresh herbs whilst baking was absorbed by the potatoes, thus making it very flavorful and this can be served together with any bbq meat. Top it with sour cream or as quoted by the Chef Curtis himself , crispy bacon and grated cheese would be great too. Do you know why I heart Curtis Stone's cookbook? Simply because his recipes are simple and yummy-licious . Preheat the oven to 375°F. Mix the salt, thyme and garlic in a small bowl. 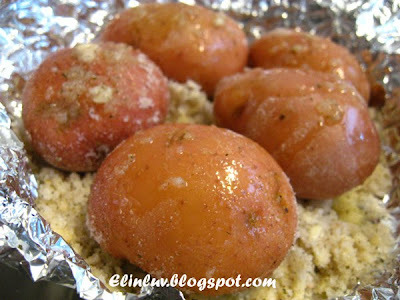 Sprinkle the salt mixture into a roasting pan, arrange the potatoes on top of it, and drizzle the oil over the potatoes . 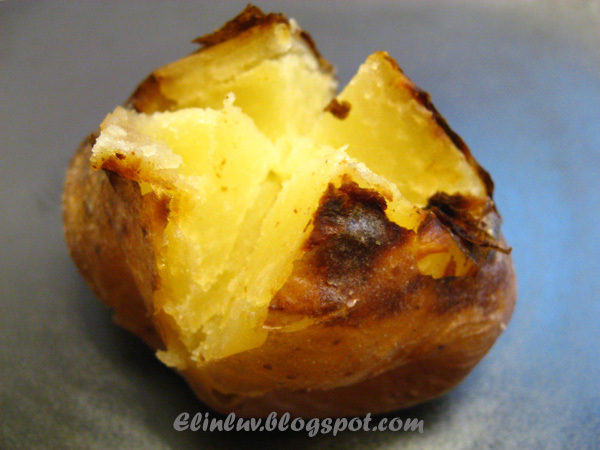 Baked for about 25 minutes, or until the potatoes are fully cooked and soft. Remove the potatoes from the oven and let them cool. 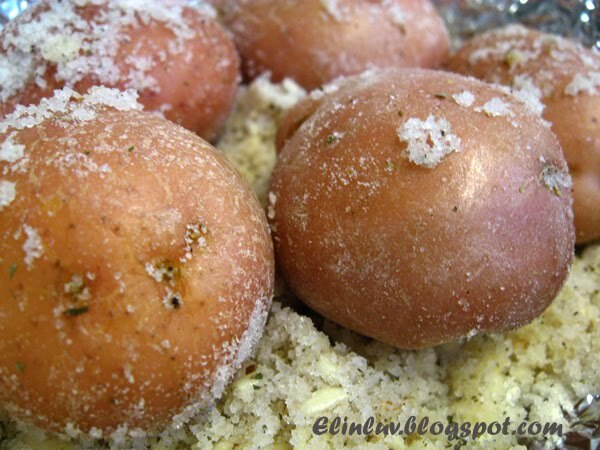 Brush any excess salt mixture from the potatoes and cut a small X in the top of each one. Using both thumbs and index fingers, press inward to open the top of each potato. 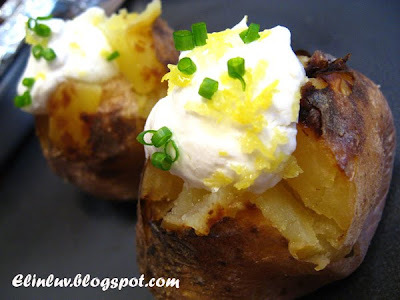 Dollop a teaspoon of sour cream onto each potato, sprinkle with the chives , and serve. what a wonderful versatile vegetable the potato is....thanks so much for sharing those baby bakers....I do love sour cream!!! and yoru photo's are amazing!! wow... now u can afford to eat more, Elin.. i jealous of u already.. sour cream with potatoes.. my my.. 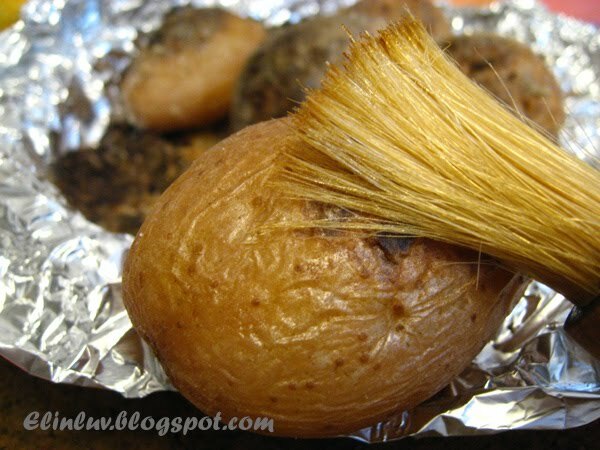 I'll have to try roasting the potatoes on a bed of salt. I am sure it's going to be tasty. 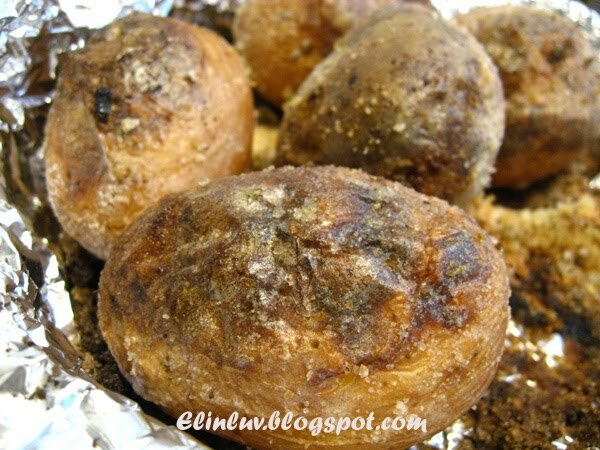 mmmm baked potatoes...look so delicious. I like the idea of using the salt as a liner. I love baked potatoes over the fried one! You have a simple but yummylicious recipe here, thanks for sharing! Thanks for this lovely tip about how to bake potatoes. I am a salt fiend, so this is perfect for me. Also, thank you for reading my Peru post on Zomppa and for your comment! your bake potato wt sour cream look better than Wendy!! I bet it's must taste yummy!! my hubby will die for it! haha! when i prepare Western meal next time, I must cook this yummy potato. This makes such a nice side! 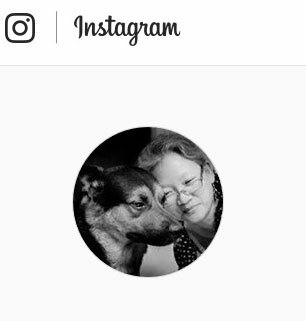 Beautiful pictures!! !That potato looks delicious. 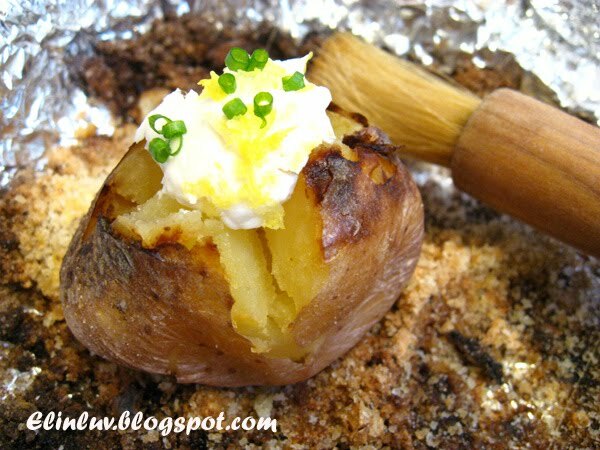 OMG potatoes are my favorite and I cook them way too often (blame being Irish lol) this looks so yummy!